I first became aware of Clay's work following last year's AAW Symposium. Mark asked me to contact Clay regarding a profile, in response to the wonderful pieces that he had seen on display. I also profiled Clay's wife, Jennifer Shirley, last year. I was looking forward to putting the profile together, finding out more about Clay, his work, background, and if living with his wife and woodturning counterpart, influences the work he produces. 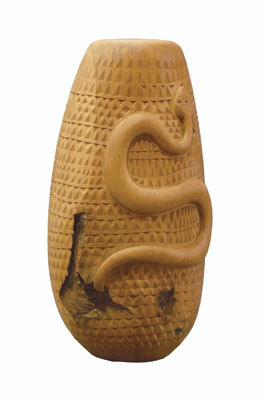 I learnt that Clay started working with wood over 50 years ago, which is a substantial amount of time. Born in 1954 in Austin, Texas, I discovered that Clayâ€™s parents were always supportive of his desire to make things, or sometimes take them apart: â€œOne of my earliest toys was a board that my father started nails in, and I would then hammer them home. On weekends we would go to cabinet shops and retrieve material from the scrap binsâ€, he tells me. Clay remembers that when he was five years old, he got his own handsaw for his birthday. His mother taught him how to embroider, and how to use her sewing machine. Clay recalls that she never reprimanded him when he broke a needle; she just taught him how to replace it with a new one. From gathering this information, it became apparent to me that this woodturner was raised in a very creative environment, with parents who were willing to push their child and teach him many skills that would be invaluable in later life. And so the seed was sown. Clay comments that this need to make things eventually led him to art school, where he studied weaving and fabric design: â€œPatterns have always caught my attention. I learned a lot in the three years I was there, but quit before I got a degree. I needed to make things more than I wanted a diplomaâ€, he explains. Clay goes on to tell me that he has been making things ever since while still studying art on his own, and in his own time. He tells me that a few years ago, he moved to Indianapolis and this has proved to be a very good decision for a number of reasons. Given his creative background and upbringing, it is no surprise that Clay discovered woodturning at some stage during his life. Whilst at school he tells me that he learnt a lot about furniture making, and saw magazine articles about pioneer woodturners including the great Dale Nish and Bob Stocksdale. Clay was very much intrigued and inspired by these woodturners and the medium of wood as a whole. He comments that the idea of starting with a piece of tree and ending up with a finished product appealed to him greatly, so he decided to pursue this avenue further: "I didn't realise how seductive that would be until it was too late", he says. Over the coming years, he experimented with woodworking in general and started to specifically concentrate on woodturning, playing around with shapes and finally producing the sculptural forms that he has become synonymous with. Clay informs me that he has been learning woodturning for 25 of the 50 years he has been working with wood: "During this time I'e made bowls, vessels, decorative objects, and sculptural pieces. My style through all that has been low tech with a few basic toolsâ€. He tells me that most of the pieces he makes are now produced with just a bowl gouge, a spindle detail gouge, and a parting tool. 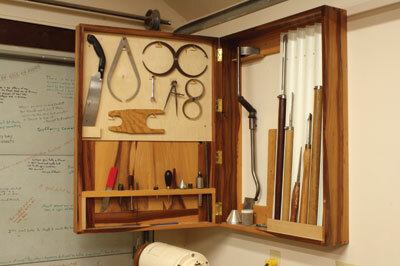 He also has some basic carving tools, a paintbrush and some milk paint. I was quite shocked to hear that Clay's pieces are made with only a few tools as the surface effects he manages to create are so detailed and refined. It is clear that he spends a great deal of time and devotes a lot of attention to the texturing and decoration phase, producing surface effects that are simply stunning. 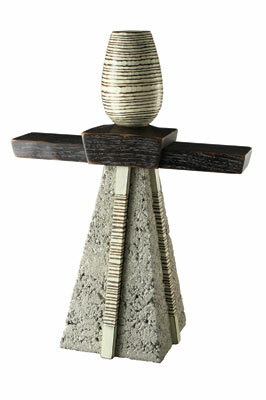 His more recent pieces contain many different elements, which all work together and are indicative of ancient temples, towers and religious buildings. has employed in his lifetime as a maker, but it relies most heavily on the shape of Mayan temples. "Almost 30 years ago, I visited the Mayan ruins at Tikal, Guatemala. The pyramid shape of two temples at opposite ends of a courtyard dominated all the other structures. Their presence embodied the essence of structures that last, materials that hold up, and designs that endure. The memory of their forms is something I put in my pocket years ago and it has just begun to emerge in the last few years as a design element for almost everything I make" While most of the work Clay does now might be considered sculptural, it is clear to see that there is more emphasis on content and image than on material and process. 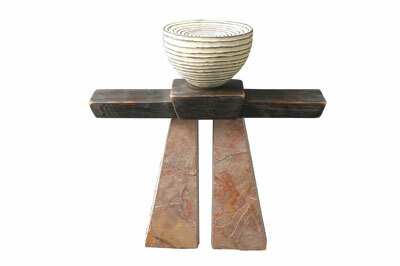 â€œI incorporated stone and concrete in my latest pieces", he finishes. 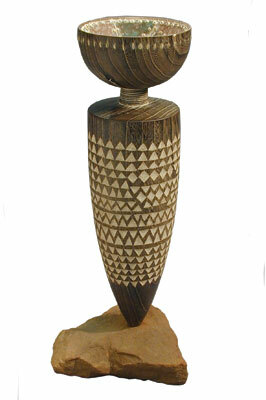 I also discovered that his pieces have been described as tribal, totemic or primitive. Clay says that he doesn't try to assign it to any particular category; it comes from so many different sources and therefore it is hard to isolate one: "It does have what I call, casual execution. That doesn't mean it's carelessly made, but that there is a collaboration between the scars and flaws of a piece of wood and the relaxed execution of a practised hand", he explains. In his opinion, most of contemporary woodturning focuses on precision, exactness, and flawless finishes: "I think there is a place, too, for the imperfections that serve as a metaphor for the reality of life, and the greater truth of the flaw. The resulting comfort deserves honourable presentation". 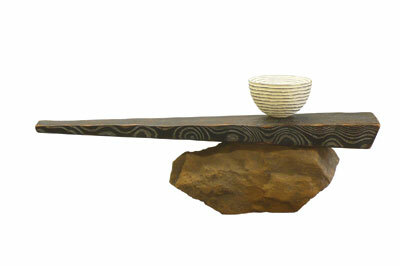 From visiting Clay's website and looking at the recent and past pieces he has created, I had a fairly good idea of what inspires his pieces - concentrating mainly on ancient buildings, temples, as well as household objects. 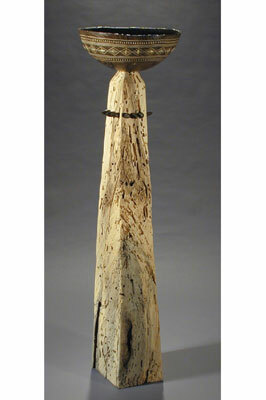 Clay confirms that his current body of work is informed by ancient architecture, old African household objects, and the affects of time and weather on the works of nature and humanity. Clay tells me that his earliest work was mostly concerned with the material and the process - bowls and hollow forms made from dramatic pieces of wood: â€œI still appreciate a well-made traditional bowl turned from attractive wood, howeverâ€, he comments. He explains that he went through most of the stages woodturners go through while he was developing his own style, including how thin it can be, how big it can be, and how rotten, spalted, cracked, and full of voids it can be. As he later moved on to assembled constructions, Clay informs me that he still felt compelled to work within the parameters of lathe-made components. In his current work, Clay uses a lathe and a piece of wood if that is the best tool and material to bring to fruition the image he has in his mind: â€œHowever, if a grinder is a better way to shape wood than a lathe, I use a grinder. If a piece of rusty sheet metal has qualities that evoke the response that I want people to have, then I'll use it, rather than try to make a piece of wood look like rusty sheet metal". He says that one thing that hasn't changed from the early days is the effort he has put into an integrated presentation of the turned object: "Rather than just plopping a turning down on a table top or mantle, I've tried to find a way to display it in a manner that creates meaning and significance", he finishes. When I asked him about the greatest inspirational source above all, Clay cites his father. He tells me that the reason for this is because he taught him by example the satisfaction and rewards that come from doing your best - a mantra that has very much stayed with Clay to this day. I was interested to hear about the place in which these fantastic sculptures are created, so I asked Clay to describe his workshop. 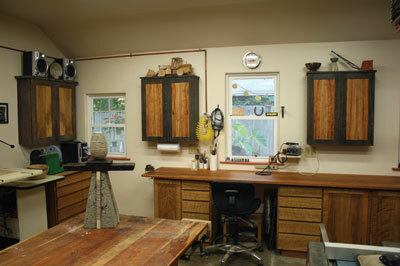 He informs me that this is an old garage that he and Jennifer remodelled into a compact but very comfortable studio that is situated about six steps from their house: â€œIt has good light, heating and air conditioning. I made all the cabinets for it. There is also an outdoor covered area where we can do really messy things like grind rocks or chainsaw woodâ€, he tells me. When I asked Clay about his work ethos, he says that he doesn't necessarily have a schedule or routine. For him, making is more of a lifestyle than a job: â€œMaking art, making furniture, making dinner, making beer - it's all just life - not separate pigeon holes", he comments. 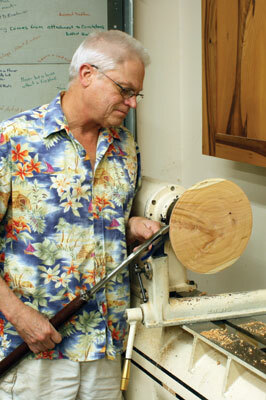 According to Clay, each turning starts with a tree and a chainsaw. Even the furniture and cabinetry he has made for the house and studio was made partly from lumber he milled himself with a chainsaw: "I'm not a tool head. My panoply of turning tools numbers in the single digits", he explains. According to Clay, each and every day has a high and a low: "There is a constant collision between the envisioned concept and the reality of materials and tools. For every triumph of problem solving, there is a corresponding frustration of new problems to be solved". In terms of turning as a career, Clay gets enjoyment from the fact that this process is the collaboration with a tree in what it becomes in its second life. I asked Clay about the future and what he thinks this will hold in terms of his work and his development. He says that he hopes to be experimenting more with cast concrete components, and incorporating these into his turning: "Concrete is an amazing material, and there is still a lot to be explored in terms of using it as an art medium beyond architecture. It will give you some wonderful crunchy textures if you don't pester it too much". Carrying out this profile with Clay's input has allowed me to gain a different perspective on the turning process and specifically on sculptural turning. 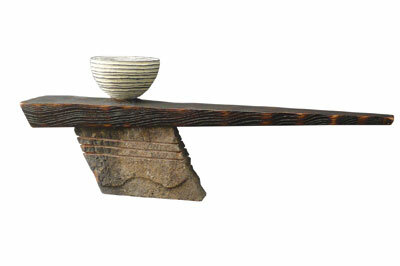 It is amazing how inspiration from such diverse sources can be incorporated into a turned piece with various components. Whilst not creative myself, I find it fascinating how people can see something such as a temple, take inspiration away, and re-order this into an object made from wood. It is difficult to put into words, but I have to say that I find this turner's pieces very evocative and powerful. Long may he keep creating pieces that are so moving and humbling.